The City Screams is OUT NOW! 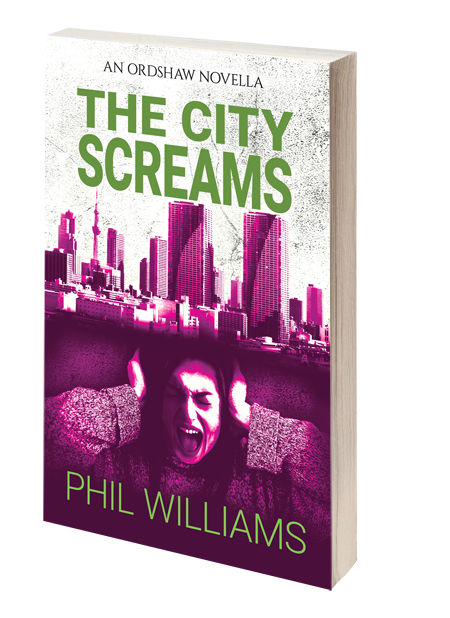 I’m proud to announce that The City Screams is now available from all your most friendly bookshops. And, of course, Amazon. Check it out here. The story’s become really dear to me, given the rather different journey the lead, Tova Nokes, took me on. She’s a profoundly deaf young woman off on her first real adventure: everyone’s sceptical that these Japanese scientists can deliver on the hearing surgery they’ve promised her, but she’s up to the challenge. Turns out everyone’s right to be sceptical. Deafness just isn’t that simple to cure. In this case, the hubris leads Tova into some rather dark places. And I’m so pleased to see it’s already been getting some rave reviews ahead of its release; Phil Parker, author of the Knights’ Protocol trilogy, has described as both “truly frightening” and “truly original”! It was a great experience seeing the world through Tova’s eyes, and it adds a whole new dimension to the concepts of fantasy and fear. In many ways this novella felt like stepping into an entirely different world, even though it’s perhaps more rooted in reality than any of my previous outings. Though The City Screams is an Ordshaw story at heart, and rest assured its details will ultimately feed back into the main story, in many ways this is a story that could exist alone, today, in the real world. Besides the dreamy aspirations of the surgery, very little of what Tova goes through is outside the realms of possibility. Of course, there are the screams. But then, who hasn’t heard screams once in a while?